FUN & FUNKY SURF/COASTAL THEMED three bedroom Holiday Beach House overlooking the Sands and Surf of Boomerang Beach. SPECIALS; Weekly 7 night rates include a 25% to 33% discount (excluding school holidays) based on Friday to Friday or Sunday to Sunday bookings so check out our weekly 7 night rates. Location; Situated on the dune rise on Boomerang Point headland at Boomerang Beach between Boomerang & Blueys Beaches, Boomer's Beach House faces North looking up the coastal sands to Charlotte Head. Just a one minute stroll down to the sand at Boomerang Beach for a swim or a surf. 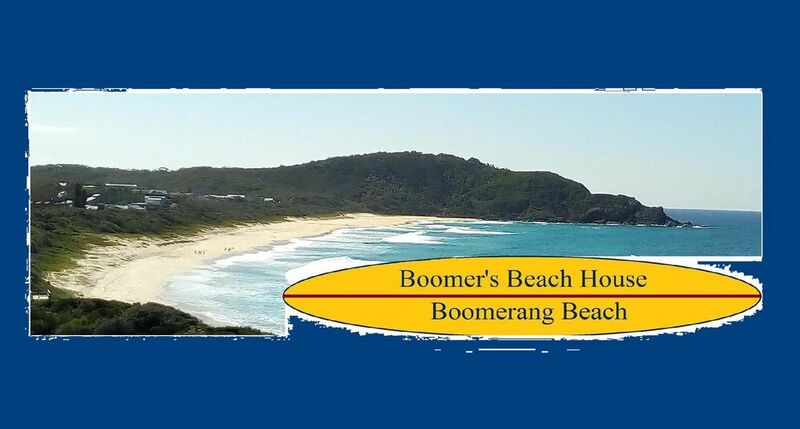 Boomer's Beach House is at South Boomerang Beach and nestled on the headland between Boomerang and Blueys Beach. Short stroll to Blueys Beach & the shops @ Blueys. 15 min. drive to Forster for shopping and dining. Aspect; North facing looking up the beach, Boomers Beach House is a warm sun trap during the cooler winter months making Boomers a year round holiday house with stunning views of Boomerang Beach, headland, sand and surf. Features include Beach & Surf Views from our Lounge, Dining and Kitchen opening to a HUGE Sun Deck with BBQ overlooking the surf & sand, large LCD TV/DVD/sound system, enclosed tropical garden courtyards, two double bedrooms with queen size beds, the 3rd bedroom has 4 single bunk beds, 2 bathrooms, laundry, hammock. Boomer;s Beach House can accommodate up to six adults or up to four adults and four children or the perfect romantic getaway for you and that special someone. BYO linen & towels or we can hire for you for an extra cost. Attractions include Surf beaches, Swimming beaches, Naturalists Beach, Fishing, 4WD, National Parks, Blueys & Forster Restaurants and Shops, Surfing, Diving, Cycling, Bushwalking, Horse riding, Sail Boarding & Sailing on the Lakes, au-natural swim & sunbake beach nearby. Having worked in travel and tourism for all my adult career, I understand what people want and enjoy in a holiday house and destination. I've always loved the Pacific Palms coast beaches and wanted a house that looked north up the beach and not east out to an ocean view that is just a blue line. When I found Boomers Beach House it was in a perfect location between Boomerang Beach and Blueys Beach. Nestled on the headland and facing north, the house looks up Boomerang Beach and is a warm sun trap during the cooler months making the house a year round holiday beach house. This was and is the beach house for me and I hope for you too. Year round warmth facing north and protected from the southerly winds. With sand, surf, beach and ocean views, what a way to spend the day lounging on our sun loungers on the deck and firing up the BBQ for lunch and diner. Sofa to the sand in sixty seconds is our catch phrase so get down to Boomerang Beach or just over the headland to Blueys Beach. Near by Blueys Beach village has all the shops and facilities to make your stay enjoyable with cafes, Chemist, General store, Surf shop, Clothing shops and Health spa. Forster is only 15 min. away. Boomers Beach House overlooks the sand and surf at Boomerang Beach. North facing, your view is up the coastline of sand and surf to Charlotte Headland (puppy dog headland) at North Boomerang Beach. Views to the north west to Booti Booti National Park surrounding Boomerang Beach and Pacific Palms. Take in the surf from the lounge, dining, kitchen and huge deck at Boomers Beach House. Single car garage and 2nd parking in front of garage TTL 2 cars. TV, DVD, Sound system and overlooking the beach. Two outdoor showers and tropical garden courtyards. Hammock in front garden area. Overlooking the sand and surf at Boomerang Beach. Facing north, it's a warm sun trap in winter, sheltered from southerly winds. We stay at boomers at least once a year, it's the perfect beach house in the perfect location. Thanks Will, look forward to hearing from you again. Great location, great place...the perfect family retreat for real Aussie beach holiday. Excellent facilities, very comfortable and able to easily accommodate a family and also I would expect it to be just as good for a few friends to use as a base for a surfing holiday. Great location for the beach, local cafes and to drive out to the Great Lakes or local rural Australia. The surfing theme throughout the house adds a lovely quirkiness that makes it even more appealing. The owners communication was excellent very welcome. Glad you enjoyed your stay at Boomer's Beach House and Boomerang Beach. Was not sent a door code or informed that owner was overseas and was not contactable so we had to wait 4 hours to enter the house.Also did not receive bond back as apparently house was left in a bad state I personally didn’t stay the second night as it was booked for my wedding party to stay in. My mother stayed next door and was praised on how clean she left the place I don’t believe my friends would have left it in a bad manner. Sorry Josh but the clear report was very poor. We had to pay extra for the mess your friends left the house in, it must have been some after wedding party. I had sent you the door code, what to pack details and address at the time you paid your balance but apparently, you didn't keep the details but wonder how you knew the address without the door code detail email. I did also send you an email before going overseas that I would be away during your stay and a phone contact for our friend who looks after the house while we are away but you must have lost that as well. We try to have everyone staying, come away with good memories but your friends didn't do the right thing by you and our house. Hope the wedding went well. Great location with fantastic view. Had a wonderful holiday at Boomers. The house was well equipped and only a 2 minute walk to the beach. Fantastic view from the deck and living area. We had a great time at Boomer's and will be back for sure. Thanks Steve, glad you enjoyed Boomers Beach House and Pacific Palms, look forward to hearing from you again.